Is vRAN Still Too Hot to Handle? Here's a modern fable for the virtualized communications era: Virgil and Phineas are chief technology officers for rival operators of similar size. An extreme sports addict and virtualization enthusiast, Virgil is sick of his traditional suppliers and the prices they charge. He picks an exciting young startup to virtualize his radio access network (RAN). Cricket-playing, conservative Phineas, by contrast, runs with his usual RAN vendors. Both projects go horribly wrong. But only Virgil gets fired. Operators are drawn to virtual RAN (or vRAN) technology and nervous about it in roughly equal measure. In a traditional RAN, baseband processing generally happens at the cell site on specialized equipment. With virtualization, an operator could "software-ize" digital processing functions and run them off generic hardware stored in more centralized facilities. Like virtualization in other parts of the telco network, the overhaul could lead to cost savings, efficiency gains and an end to the dreaded "vendor lock-in" -- if the challenges can be overcome. Problematically, there is no single blueprint for a vRAN project. The different approaches involve trade-offs, and some look extraordinarily complex. Moreover, in trying to batter open the RAN gates, operators may hit resistance from the vendor giants worried they will lose out in a vRAN future. And with a multivendor network, there is concern suppliers will deny they are to blame if problems emerge. "When components belong to different people and you don't have an integrator taking responsibility, then you are in trouble," acknowledges Spinelli. For some operators plotting the rollout of 5G networks, the cost savings of using vRAN technology are paramount. According to Bruno Jacobfeuerborn, the CEO of Deutsche Telekom AG (NYSE: DT)'s towers business, a traditional RAN would account for about 70% of overall spending to build a 5G network. His goal, he says, is to cut those RAN costs by half, partly through virtualization. In a fully virtualized RAN, operators would be able to reduce expenditure on hardware, software and services by around a quarter, says Spinelli. Another Tier 1 operator that spoke with Light Reading also sees RAN virtualization as a way to lower the equipment bill. 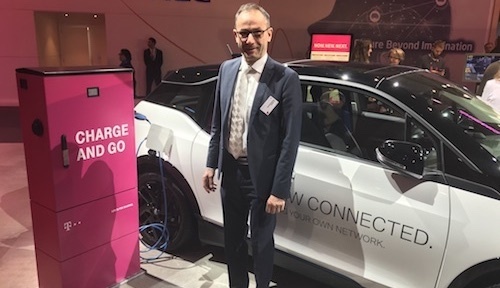 Deutsche Telekom's Bruno Jacobfeuerborn shows off some of the German operator's latest tech at the recent Mobile World Congress. Perhaps the most high profile of these various interfaces is the common public radio interface (CPRI). Not a 3GPP-specified interface, CPRI is used in the fiber-based "fronthaul" connections between radio units and baseband equipment. Just as countries that include the word "democratic" in their official names are usually the opposite, so "common" is quite the misnomer here, according to Rethink Research, another analyst firm. "The CPRI interface … has been controlled by a small group of vendors, which implement it in semi-proprietary ways," said the company in a recent note about its vRAN research. "This raises high barriers to entry for alternative equipment providers." While the big suppliers may have little incentive to open these interfaces, they are not necessarily being deliberately obstructive. In other parts of the technology industry, open technologies have been tweaked to improve performance and resilience, and not always to shut out rivals. "It's too simplistic to say CPRI is closed only due to incumbent vendors' blocking tactics," says Brown. "There are good reasons for tightly integrated, highly optimized systems." The consequence, though, is to make those architectures somewhat less open. On the hardware side, too, South Korea's SK Telecom (Nasdaq: SKM) doubts whether more generic equipment would cope with the high-performance needs of a 5G network. Amarisoft’s Spinelli, unsurprisingly, is unsympathetic. "All of this is the last resistance of the hardware vendors," he says. "They are trying to keep their dedicated components." Next page: How would you like your vRAN?